Well, that didn’t last long. Remember how I told you that Tori Spelling and Dean McDermott sold their big house in Encino and moved their family of 4 into a 3-bedroom house in Malibu last fall, a month before giving birth to baby #3? Last we saw them on their reality show Home Sweet Hollywood, they were happily settling in. Since then, they were surprised with a 4th pregnancy and realized they would need more space. So now the cozy green house in Point Dume is back on the market and they’re moving on. Again. They bought the house in September for $2.4 million, made about $100,000 worth of upgrades to the house, and have now listed it for $2.675 million. Some improvements they made to the house in the short amount of time they lived there: new appliances, a chicken coop in the backyard, and the installation of 100-year old reclaimed oak wood flooring from France. The house sits on 1.8 acres in the Point Dume area of Malibu. It has 3 bedrooms, 2.5 baths, and 2,300 square feet. Would have loved to have seen how it looked when their furniture was still in it. Wonder if the hens come with the chicken coop? 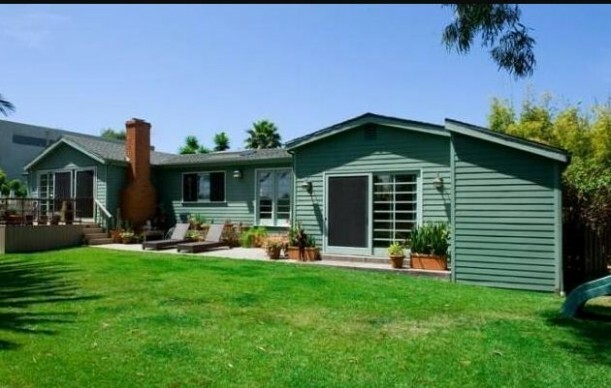 See how the house looked when they bought it: Tori & Dean Downsize in Malibu. P.S. You can also check out pics of their former home in Encino here. I was impressed by the makeover she gave their family room. Click Here to See the Top 10 Most Popular Celebrity Houses! The 4th??? Wow! That’s beautiful! I have 3 children and I’m loving having a big family. It’s a lot of work, but so great! I can’t wait to see their new home. They always know what they’re doing when it comes to decor. That Tori certainly keeps you in business Julia! I’m waiting for the day when the McDermott menagerie has to make an offer on the Manor, for the sake of space. Oh I so bummed… I loved that cozy rancher and wanted to see what the Spelling-McDermit’s would do with it over time! Yes, to everything you said! I’m bummed they are moving out, as this house had a ton of character to it (that bookcase for a wall!). It’s no wonder they outgrew their current house so quickly. It’s looks small compared and certainly not as grand as their last house…I’m sure her bedroom at the Spelling mansion was bigger than her house in Malibu. I can’t wait to see the new digs….I’m counting on you Julia to keep us up to date! Tori seems to have a knack for decorating, and appears to be a loving mom. Oh, and she has great taste in flooring!!! I can see Tori has not been afraid of bright colors or large patterns. She has a great sense of drama and fun. More drama than is in my comfort zone, but they seem to love it. I would love to see the finished house but it may need to be on their show before it is shown elsewhere. Sometimes you get all the projects done so it’s time to move. I speak from experience. We will stay in our current home for many years because we will never run out of projects. More videos of Maizie, please. Such a cutie and her Before and After story is so heartwarming! I think she is never satisfied with where she is at that moment. She always needs a project. She should buy one house for the ‘forever’ house to build memories in. Then go and buy some massive house to remodel and that will keep her busy for years. Her kids are moving as if they are in the military. I can’t imagine that is fun after a while. I never did see how that ranch they bought last was going to work. I am all for kids sharing a room. But, when a brother and sister so close in age are fighting sharing a room and asking for space (my pediatrician says) that you should accommodate them. Even if it’s just a closet sized room. It’s theirs and it makes them feel like they have their own space. She has great taste. So I am certain the next house will be stunning. I saw her in an interview and she said “clearly I am proof you can get pregnant while breastfeeding.” I can’t imagine having a baby on the way already. I am sure she is exhausted. And moving! Wow craziness! I think Tori would be happier as a realtor, interior decorator, and/or architect with all the moving she is doing. Can’t say I don’t blame her, if I had the money I’d love to buy a house just for the sole purpose of fixing it up. I love what they did to the ranch. I’m sure you’ll get the scoop about their new digs; can’t wait to see where they move to…maybe a chic llama farm? Maybe they moved in with Candy. She has 17,000 square feet. They probably were bursting at the seems in that house. Too hard to keep clean and toys put away for prospective buyers. If I had to live in a house like that, I’d probably move out, too. Wow! it even looks cool without furniture. oh to be able to move whenever i wanted and have somebody do all the work. that would be quite a luxury. Keep us posted Julia!!!! I found your blog by searching for pics of Stella’s nursery in their first house … I was looking forward to seeing the renovations they made to this house. I agree it would have been fun to see it with their furniture in there. I, too, love those floors! Love Tori and Dean but I hope they can plant some roots now. I feel for the kids. I sure wanted to see them doing up this house and living there in the country awhile. Where could they be going? they showed this house yday on E! news and there was still food in the fridge, they must have just moved out. Maybe coming back the chicks? lol ! Cant wait to see their next place, Julia hope you keep your eyes and ears open. Think it will be more like a farm? Even before having their fourth child, they should not have moved to a home of less than 3,500 sq ft, which would be half the size of their previous home. Anything less would feel cramped. I can not imagine why on earth anyone with their money would buy a house where their son and daughter would be forced to share a room, and style it with boy/girl decor split down the middle. Decor that tacky should only be considered as an absolute last resort! California is a very expensive place to live. The only reason I can possibly think of Tori & Dean purchasing a smaller house and forcing opposite gender kids to share a room is finances. Who downsizes with 3 little kids? I am not one bit surprised Tori and Dean moved. This house was way too small for their family to begin with. Especially because they were all use to living in such a huge house. It will be interesting to see what they buy next. I know I am certainly going to keep an eye out. It’s interesting how many people seem to think this 2300 square foot house was too small for a family of 5. I can see the angle that Tori is used to having an excess of space in the past, so that might affect things. But I would argue that this is plenty of space to raise 2 to 3 kids in! Four would have been pushing it, but they could have built on to the house at that point. Just my opinion! I don’t think its the 2300 sq ft. It’s their long careers in acting that has so many people surprised about their home purchase. You’d think they would have one place and added on by now. Tori is certainly a project gal. Creative, sure. Exhausting, definitely. She needs to put down roots, and I think she will . . . eventually. But to do that, she’ll have to stop jumping at almost-good-enough houses and take her time deciding. I don’t always like everything she’s decorated (the inn), but she does seem to have quite a flair for design. I think she could be quite successful if she chose to take her career in that direction. Or maybe she and Dean are just serial flippers. Hard to make money doing that in the CA real estate market these days, but . . . I was pretty surprised too hear about #4 as well. But not surprised that they decided to move on. Interesting to see what houses are perceived as too small or large. I wonder what someone from the Tiny House movement thinks. Not one bit surprised. I understand wanting to feel that connection to family that you just wouldn’t be able to have in the Spelling Manor but a house of this size is just much too small for a family of their size (which apparently keeps growing). OMG I really like this place. But it’s the goat that’s cracking me up. I know–gotta love that they have pet goats! Actually love the green kitchen. I’m reeling from the thought of having 2 kids who are both less than a year old. She noted the baby was a month old when she got pregnant again! Must be a bit like raising twins. The flooring is beautiful and I especially like the family room with the fireplace, arched ceilings and access to what looks like a deck. On my screen the kitchen looks more like a yellow/green, but more yellow. I’m not a fan of that color, but only because I had to live with the original yellow metal cabinets that were in my 1950’s ranch. There was also a yellow floor to boot, so it was an overdose which led to my distaste of those colors which still continues. Also it doesn’t surprise me, since their previous space was much larger that a downsize would feel too small, and even more so if they are flush with money to afford a much larger home. The kids need separate rooms. I’d probably neutralize their spaces if I intended to sell. Was question about who’s taking care of the chickens too much? Dear God! Didn’t they remember how it happened the last three times?! I knew they wouldn’t last in that smaller house. I guess it sounded like a good idea.. oh well, good luck to all.. I have enjoyed watching their show and seeing how they are doing as a family and do agree a 3 bedroom house just would be to small for their growing family and although I would like to see their new home I don’t mind waiting until the next season of shows because after all they are first a family before celebrities and deserve their privacy to raise and enjoy a family. Wish them well and much happiness. I figured they would come to the realization that that was just a tad bit too drastic of a “downsize”!!!! Not my style. I bet they wanted tear it down and build something bigger, but Malibu wouldn’t approve the plans….just a hunch… Maybe that’s why the were hardly there. Ok is it just me or are they walking a goat in that first photo? It does not look like a dog at all! I read on another of my favorite real estate blogs The Real Estalker that the Spelling McDermott clan has landed in Thousand Oaks Cal in a large house they are renting, it has a few photos who knows how long they will be there! Darn, it’s too bad I didn’t see this post earlier. I was in LA last week and went to her book signing. I could have asked her then! we were able to have one on one time with her while she signed our books. I’d love to go to one of her book signings. How fun! What’s with the low end appliances? Anyone know where they went? Last I heard they were renting a bigger place in Thousand Oaks. Not sure if they’ve moved on yet or not, though.